Yorkshire Pudding is a popular pastry which is served in the English cuisine as an accompaniment to steak, roast beef and other roast meats. It is a staple in traditional British Sunday lunch. Although it is less common today, Yorkshire Pudding was traditionally also served as a dessert with golden syrup, jam or orange juice as a sauce. The pudding is made from a dough of flour, milk, eggs, grease (traditionally suet), salt and possibly pepper, parsley and nutmeg. There are two ways to prepare Yorkshire pudding. It can either be made over high heat in a pan or casserole in which the dough is cut into diamond-shaped, finger-thick pieces after it is baked golden brown. 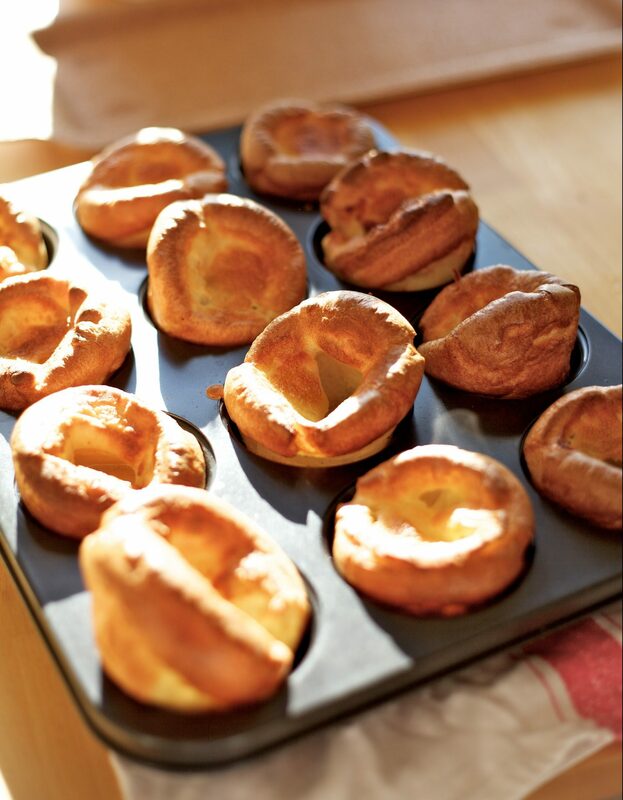 For the other method, the dough is poured into specific Yorkshire Pudding pans or muffin trays. By using these, the pudding gets its typical trough into which you can pour the gravy later. Either way, Yorkshire Pudding is usually cooked under the piece of meat so that the juice drips down into the pudding and adds additional flavor. When wheat flour began to be commonly used for making cakes and puddings, cooks in the north of England invented a way of making use of the fat that dropped into the dripping pan to cook a batter pudding while the meat roasted in the oven. The recipe was first published in a cooking book in 1737 as “a dripping pudding” before it was renamed to Yorkshire Pudding by Hannah Glasse ten years later. It was she who re-invented the original version which had been cooked in England for centuries, although these puddings were much flatter than the puffy versions known today. The traditional way of eating the pudding was as a separate course prior to the main meat dish which is still common in parts of Yorkshire today. Since the rich gravy from the roast meat drippings was used up with the first course, the main meat and vegetable course was often served with a parsley or white sauce. In poorer households, the pudding was often even served as the main and only course. Using the drippings and blood from the roast they may have enjoyed earlier, a quick and ‘stodgy’ meal was made with flour, eggs and milk. This was traditionally enjoyed with a gravy or sauce of some kind, to moisten the pudding. Thus a meal included both proteins and carbs – enough fuel for another day in the field. First, heat the oven to 230° C.
Drizzle some sunflower oil evenly into two specific 4-hole Yorkshire pudding tins or a 12-hole muffin tray and place it in the oven to heat up the oil. For the batter, pour 140g plain flour into a bowl, add four eggs and beat until smooth. Gradually add 200ml milk and keep on beating until the mix is completely free of lumps. Take the hot tins out of the oven and carefully pour the batter into the holes. Place the tray with the dough back in the oven and leave undisturbed for 20-25 minutes until the puddings have puffed up and browned. It is very important that the oven door is not opened during this time. You can either serve them immediately or let them cool down to store in the freezer for up to 1 month. Find more food and drinks from England here.